The last full moon of the year lingered in the early morning sky, lighting up the meditation circle as I looked out from an upstairs window. Winter lies ahead but spring’s return is on my mind. With winter solstice just four days away, I am heartened to note the days become shorter just four more times before that trend reverses. Today the length of day will be 9h 43m 11s. On December 21 it decreases down to 9h 42m 45s, then the day’s length creeps back up. Frosty ice enveloped stems and leaves in the garden overnight accentuating the mounds of Thyme that form part of the labyrinth’s walls. The large hole in the foreground is damage from mole/vole activity. Solar-powered mole repeller stakes that emit a pulsating sound underground worked well this spring and summer to keep them at bay, but the devices do not last very long. The Pansies and other plants that line the path of the labyrinth are stressed from the daily cooling and warming. With other parts of the country already besieged by ice and snow I am not complaining. It is sunny and almost 60°F. this afternoon and by Saturday the high will reach 70°F. 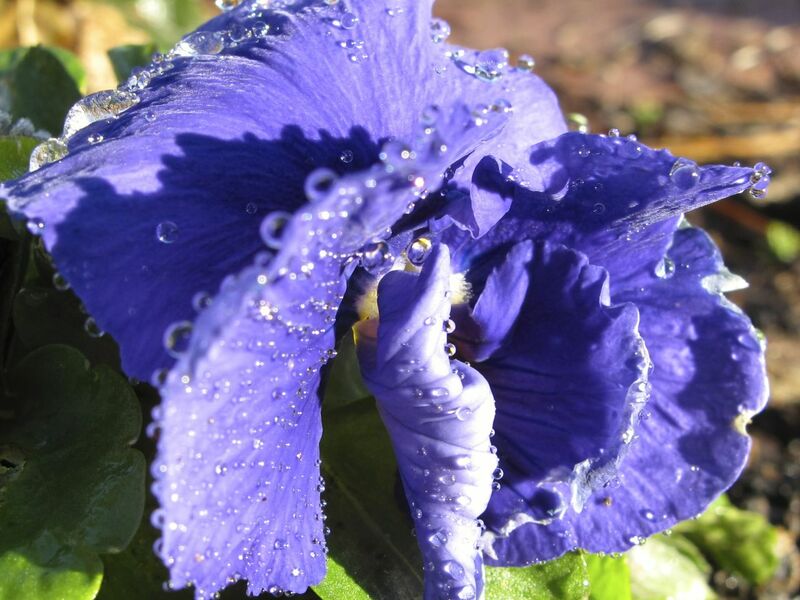 This entry was posted in garden and tagged almanac, labyrinth, meditation circle, meditation path, thyme, Viola 'Delta True Blue' (Pansy) on December 17, 2013 by pbmgarden. 60 degrees! I wish! 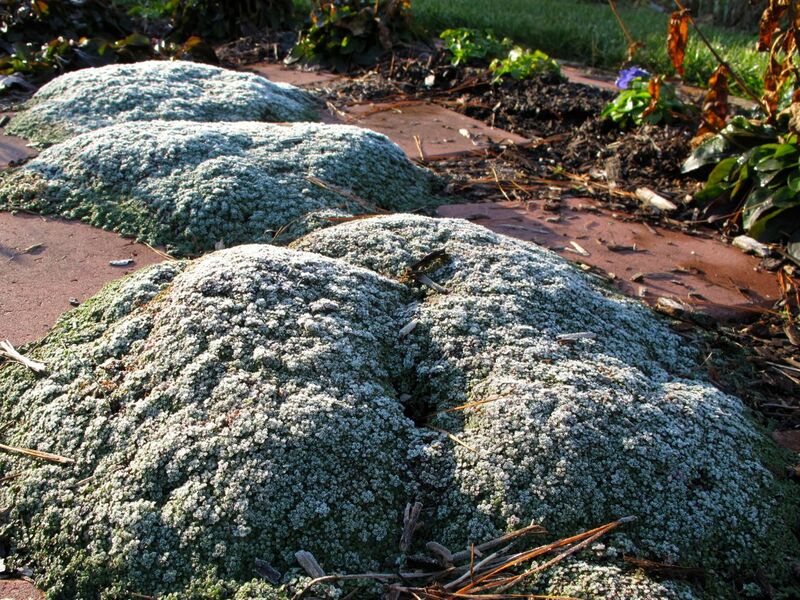 The thyme mounds look very much like corals with frost on them, so lovely. 60 degrees suits me. Hope it will warm up for you as well. The thyme does look like coral–I had some closeups that seemed even more so. Those mounds of frosty thyme look pretty with the sun shining on them! I think I’ll have to plant some more in my rockery. Have a nice day Susie! Cathy, this particular Thyme has no fragrance, which is weird, but I do like its mounding form. Your rockery is lovely. I, too am counting the days until the days become longer. I’m in the UK at present and the days are one and a half hours shorter than in Lazio, it seems like night the whole time! Precious daylight. Christina, enjoy your visit. I have also been looking forward to the point when the days start to lengthen again. Something dispiriting about leaving the office at 5 and finding it already dark. Yes, leaving work in the dark makes you feel you’ve missed the day. I am with you–I can’t wait until the days become longer. Even just a tiny bit helps. Yes, the longer day length makes such a difference. At least we have a bit of warm weather coming up too. But mercurial me, I can’t decide whether to be ecstatic or despondent! As lovely as the temperature will be, I cannot get into a Christmas mood when it’s 75 degrees outside; I start despairing about global warming and erratic weather patterns and etc. But I shouldn’t whine: Plenty of our more northerly friends would be delighted for some of this weather. I resolve to keep my chin up and remember the years I spent in Chicago when the sky stayed gray until late April. That’s the spirit–be brave! I am not a year-round gardener and this nice weather makes me feel guilty for not bring outside taking care of the weeds that have cropped up. Have a nice Christmas! Subterranean activity of moles and gophers is as disheartening as the digging and scratching of cats and dogs that chase the moles and gophers. Every garden is a compromise with nature. What about a mixture of scented and unscented thyme. A shrub (or two) whose roots moles and gophers dislike (daphne, peony, Tuscan rosemary, lavender, sweet bay) with flowers and bulbs moles and gophers don’t like (narcissus, crocus, echinacea &c.). Protect yourself with indigenous improvised botanical countermeasures. What attracted our attention was the haiku like title of your post, “Long Night Moon”. It seems gardeners and season watchers are as sensitive to the ebb and flow of light as are plants. We groan at the tug and push-pull on our metabolism to return to its pre-electric light genetic programming. This is healing to be aware of how our rhythms are diverted. Not sick. Gardeners have the special opportunity to observe life’s tracks running to and fro through the seasons. Your comments come at a good time as I am rethinking how to plant the meditation circle. It’s a good problem to have and I will keep your recommendations in mind. Already I am aware of the lengthening days and looking forward to watching another cycle of growth.